While best and cheap are not two adjectives that often go well together, using Smart DNS services are both, the cheapest and fastest way to unblocking content. Here’s my list of top Smart DNS providers, worth considering in 2019. Besides the cost, and having a different set of supported TV channels, video streaming sites amongst Smart DNS providers — there are other differences too. This is by far, the cheapest provider and one of the most popular ones with a long list of supported video & music streaming sites, currently somewhere at 400+ channels from pretty much any country location, they are of top value. Their parent online security company “Global Stealth Inc.” has been around since 1995, which launched their Smart DNS services in 2013. So they pretty much know what they are doing, and provide 24h live chat support to walk you through it if any problems arise. Even if you’re not watching an online stream, you can still use the internet normally and fast with the DNS configurations enabled. Which is the likely outcome because it’s bothersome to change them every time. However, this is not best practice. Also there is only support for US Netflix, but other than that, it really gets the job done and they provide a reliable service amongst the best & cheapest. This provider has the best and easiest user experience, by far. They are also very cheap, while providing a cost free VPN as extra with every plan. 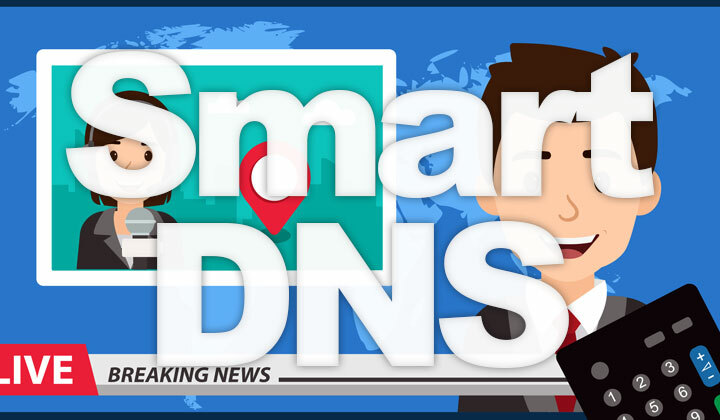 Best of all, connecting to the Smart DNS and changing your country region, and other settings is a breeze through their easy to use connection client software. Yes. You can enable/disable the service with a click of a button! Not as many channels are supported as some of the competition. But go for it if they have what you need. Personally I swapped to these guys, and can highly recommend them as amongst the top modern Smart DNS providers. They are actively working behind the scenes to make sure everything works smoothly. While they are not cheap in comparison with many other Smart DNS providers, this company has put it’s focus on an impressive list of supported streaming sites. For example, it works with Netflix country regions from 21 countries, something you cannot find elsewhere. So if channels are a decisive factor in choosing the best service, then you will find good value here. There are so many TV channels, and live streams that you can unblock with Smart DNS technology, like TVPlayer, BeIN, Hulu, 9Now, iTV, Fox, PBS, StarSports, AMC, Stan, NowTV, SVT, Amazon Prime, ESPN, 4oD, Animax, ArteTV, GlobalTV, BBC, FranceTV, 6Play, DMAX, Pandora, TVNow, HBO, American Netflix, Zattoo, DR, HGTV, History Channel, TV10, WWE, Dazn, DittoTV and so much more. But these services are not just restricted to video streaming online, also you can find your way around geo restrictions for popular sites like Facebook, Google Search, Vevo, Twitter, YouTube as well as PlayStation Apps to name a few. Furthermore, geographical circumvention for most countries is available, like for example Australia, Belarus, Canada, China, Denmark, Egypt, France, Germany, Hong Kong, India, Indonesia, Ireland, Italy, Japan, Kazakhstan, South Korea, Lebanon, Mexico, Netherlands, New Zealand, Norway, Pakistan, Philippines, Qatar, Russia, Saudi Arabia, Spain, Sweden, Switzerland, Taiwan, Thailand, Turkey, United Arab Emirates (UAE), United Kingdom (UK), United States (US) as well as Vietnam! Hope this guide helps you to find what you are looking for. Any questions about these top Smart DNS providers? Or what do you recommend as the cheapest, best service? Comments are very welcome below and please, if at all possible I would very much appreciate a quick social share below to spread the love. Also a notification measure I would like to let my readers know that some of the posts and links within them are affiliate with third party companies. This won’t affect your experience with them, and storing cookies which track sales is voluntary. Thank you for supporting me. Sincere regards, David.